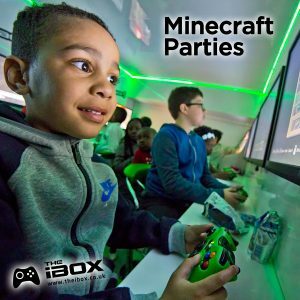 Having performed hundreds of children’s parties since we started in 2011, the iBox can confidently confirm that our xbox parties are the best kids birthday party ideas in children’s entertainment (actually we don’t just stop there we’ve done a 40th birthday party too). Why do we make such a claim? First and foremost it’s the kids that come out of our parties telling us and their parents that they’ve had the best birthday party ever! From the parents perspective they have just organised a successful and memorable party, which is stress free, brought to their doorstep. They can either put their feet up, spectate or even join in. Check over 100 5 star reviews on our Facebook page. One of the key advantages of our parties is that our entertainment is all contained within our party bus, we can park this directly outside your home or we can arrange this at one of the 24+ North West family friendly venues that offer parking and kids meals. We have three ways of combining food with our parties, first is to feed them in your home either before or after our entertainment. Second we can arrange to host your party at a local family venue. Third from your home book a little longer and bring the food onboard, that way the children are dropped off and play from start to finish and get collected at the end of the games, in the middle is a food break where pizza or happy meals etc are brought in, we do not allow play at this point (try not to mix our controllers with ketchup). Our kids birthday party ideas can entertain lots of children. Our Minecraft Party is best suited to entertain 9 children per vehicle. We have a created our very own iBox world in which all children compete in different challenges. Some of which require parents to judge the children’s creations. All rounds are scored and we offer a choice of prize to the winner. Minecraft is popular for both Boys and Girls parties, we do recommend some experience of playing Minecraft but if anyone is struggling with the controls, our party host is there to assist. Our Fifa League party is just as popular, we can entertain numbers up to 11 per vehicle, the league can be set up as Internationals or Premier League derbies. For larger numbers or for Junior Football team parties, we can host a 16 player Cup, with group stages and finals. 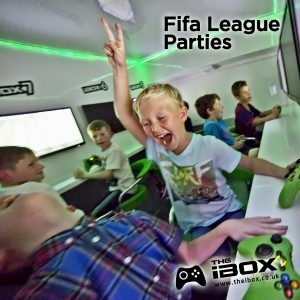 This party format is fantastic fun for kids that enjoy playing Fifa, we can complete an 8 or 9 player league in 60 mins and a 10 or 11 player league in 90 mins. Again the winner gets to choose a prize of their choice. This really is the best way of finding out who is the best at Fifa, it is always funny when we ask ‘who’s the best at Fifa?’ we always get half a dozen hands flying up!! 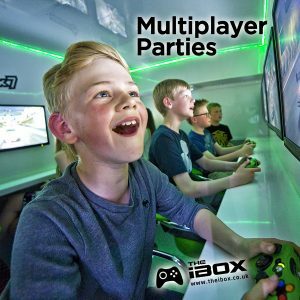 The iBox was initially created for Multiplayer parties. These are games that all consoles and screens link up for races or battles, all children are competing against each other at the same time. This party is the most flexible as 9 children can play against each other in 5 minute rounds, this means we can entertain larger numbers that rotate through the seats, so everyone misses a turn fairly. Each vehicle can entertain up to 12 children at a time, for numbers larger than this you can always book 2 iBox vehicles, when linked together this allows for 18 player races and battles. Now that we have 3 iBox vehicles, it is possible to host an epic 24 player battle of Call of Duty!! For further information of the games we can offer and the age ratings of these games, please see our games information page. Please bear in mind we are not responsible for allowing children to play sensitive age rated games, this is a parental decision. We have party invitations that include age range check boxes that inform parents prior to the party of the age ratings of games that may be played. We can mix and match these party formats if enough time is booked, for more information please contact Ben on 07966 360 880.